Children’s Campus Zuidas accommodates a primary school, day-care centre, after-school care facilities and sports hall. Fact Architects and Hund Falk Architecten jointly designed this light and airy, spacious school with a vibrant heart. An open structure of raw wood components in steel frames has been placed in front of robust external walls with large aluminium windows and sheet material. The first phase was built behind an existing sports hall. After the existing structures, including the sports hall, were demolished, the second phase was completed. The first section of the building was then moved 30 metres and almost seamlessly linked to the second. Both sections of the building consist largely of prefab components and were constructed within a very short time on site. ‘If the number of children continues to grow as expected, an extra level will be added to the lower section of the building mid-2017,’ hopes Peer Glandorff, who co-designed the school with Hund. Wide bleacher stairs connect the ground floor with the library above. At Children’s Campus Zuidas, children aged 0 to 12 can learn and play from 7:30 to 18:30. The education offered is based on continuous learning. Hund explains how the architects translated this into their design: ‘We designed the building such that children of consecutive ages can come in contact with each other in a natural way. For example, in the large central area, which serves as an assembly hall and play room. This is a space for all ages.’ Wide bleacher stairs connect the ground floor with the library above. Glass walls and a big vide (open space) with glass roof allow lots of natural light to enter the central space. In addition, the school has a clear spatial layout. There are four clusters of four classrooms, grouped according to age ranges. After-school care is provided in the large areas between these rooms. ‘The school layout and connection with surrounding outdoor areas ensure that this is a special, pleasant space for the children and teachers to work, learn and play in,’ Hund assures. The gym on the top level of the school is also used by other schools and sports clubs. The gym can be accessed via a stairwell with lift, which can be closed off from the school. Raw wood, shiny aluminium and large windows characterise the external walls. They are made of standard components, both in terms of composition and dimensions. Depending on the rooms behind them and the orientation of the sun, the wall components have been fitted with glass or aluminium sheet material. Glandorff: ‘The whole of the ground-floor wall consists of glass panels. The group areas and gym on the other floors have extra-large windows; the gym even has a window of 3.6 by 5 m.’ One type of slimline aluminium window profile by Reynaers was chosen. The anodised aluminium goes well with the wood and steel. Soundproofing was also important in the choice of windows because of the busy location. Finally, price was also a consideration, as the building had to be completed within a tight budget. D'n Boeij Aluminiumbouw was responsible for all the windows. 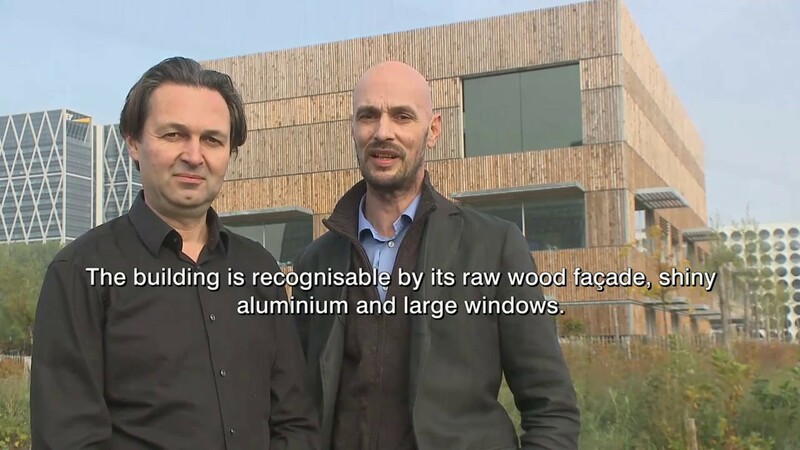 In the short video below, the architects of Fact Architects and Hund Falk Architecten talk about their design for Children’s Campus Zuidas. The other outdoor areas, including nature gardens with climbing trees, waterfall and small beach, a sports fields and kiss & ride zone were designed by the Department of Planning and Sustainability of the municipality of Amsterdam, Het Wilde Land and Zandraket. The finish of the interior is uniform, with identical acoustic screed floors in a light grey hue throughout the school. The finish of the interior is uniform, with identical acoustic screed floors in a light grey hue throughout the school. The walls are clad in a patchwork of wood plate materials of different types of hardwood. The rooms and gym have been created with as much ceiling height as possible. Wires have been concealed in the openings behind the lower ceilings. The windows behind the wood façade grids can be opened. Children’s Campus Zuidas has a good indoor climate. Overall, the school meets the Clean Schools category B standard and even the highest possible category A standard for air quality.